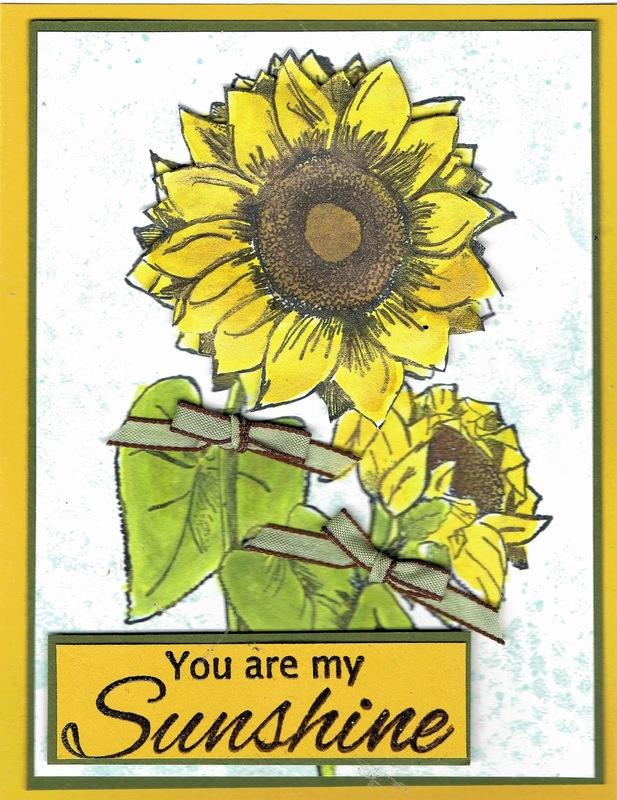 Many of the Design Team loves this sunflower stamp. 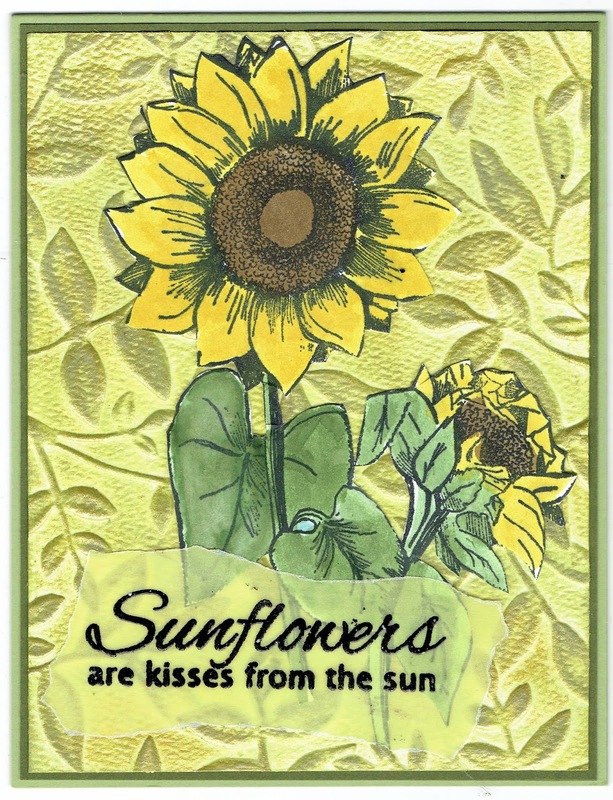 It is Technique Junkies Stamps Sunflower Duo, and is paired with Sunflower Sentiments, which is heat embossed on yellow vellum. I adhered it with a Xyron machine. 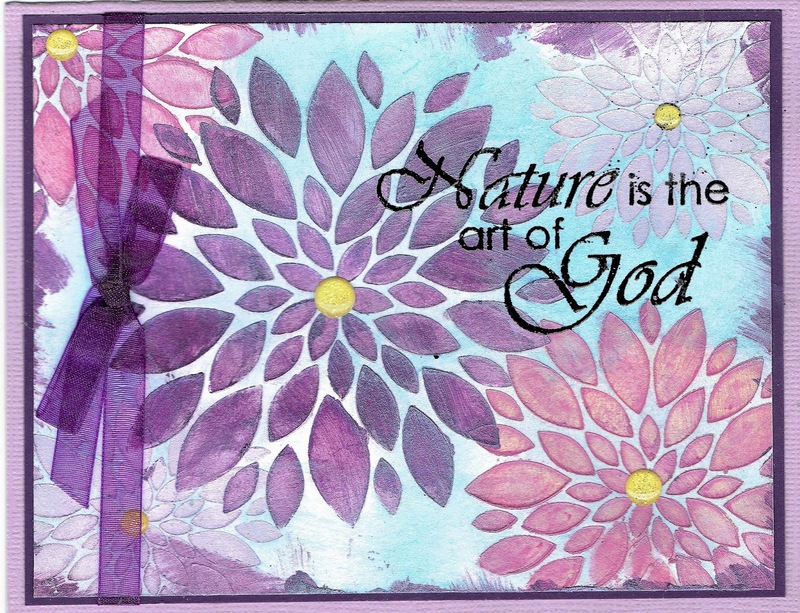 The background is created with an embossing folder and the leaves are sponged with ink. To highlight the leaves, I also used a sponge and very gently sponged on a little gold Nuvo Mousse. It added a yummy shimmer to the leaves! I fussy cut the sunflowers and adhered them to my card, and then added the vellum. Please remember that you can gain a 10 % discount on everything not on sale if you use the code TJ10Judy! Have a marvelous Saturday and get inky! 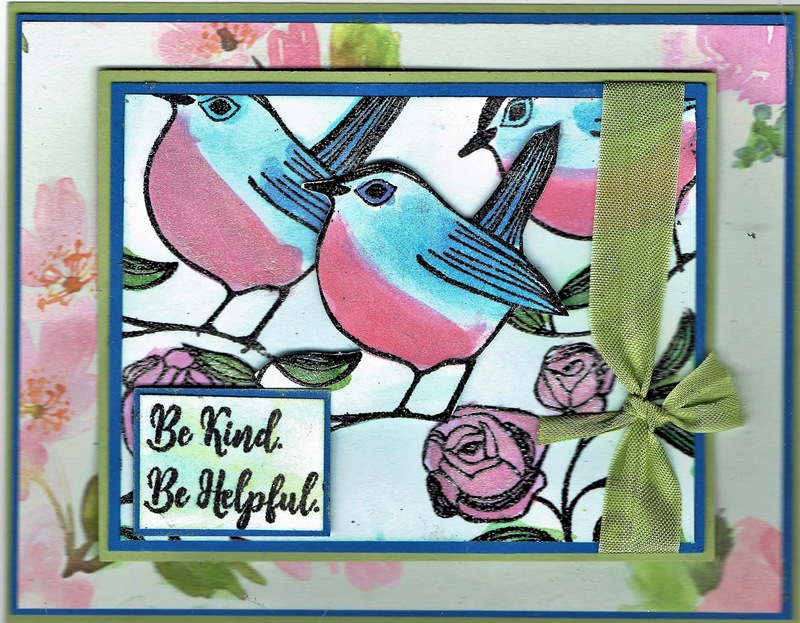 And remember today is the wonderful blog hop for the Technique Junkies July Release! The stamps are wonderful! 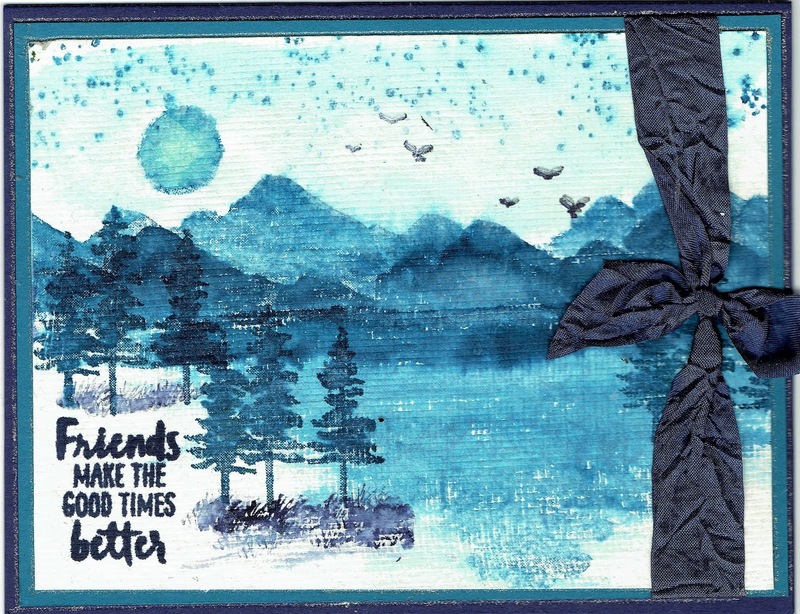 I used two Technique Junkies Stamps for this card: Map Collage and Road Trip. 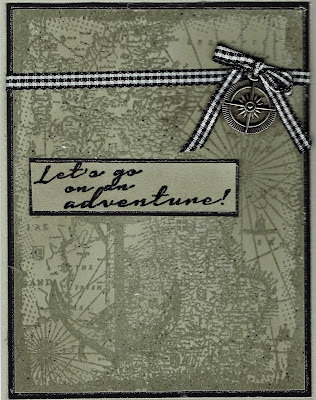 I used a pale green paper and clear embossed the map image. Then I took a sponge with the same color of ink and burnished the ink all over the image. It really makes it pop! The words are from Road Trip and are heat embossed and layered on black card stock and adhered directly to the card front. 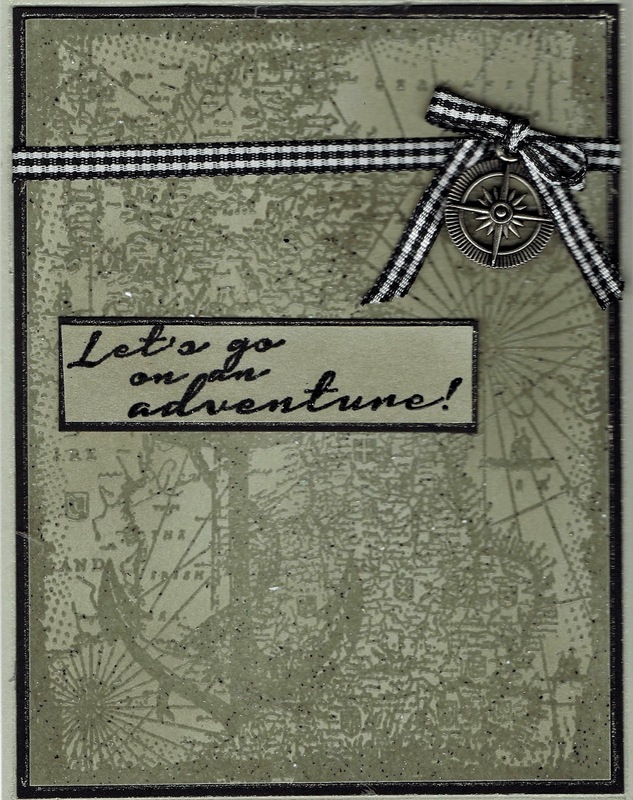 I love this stamp set from Stampin' Up! I used ink pads, markers, and aqua pens to create these cards. I also used Wink of Stella to add glimmer and definition. I also used a "grass" stamp from Art Impressions to add grass around the trees. 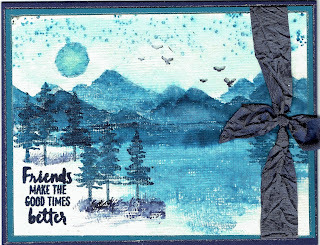 I used a homemade cloud stencil and a sponge to create the sky on the first card. 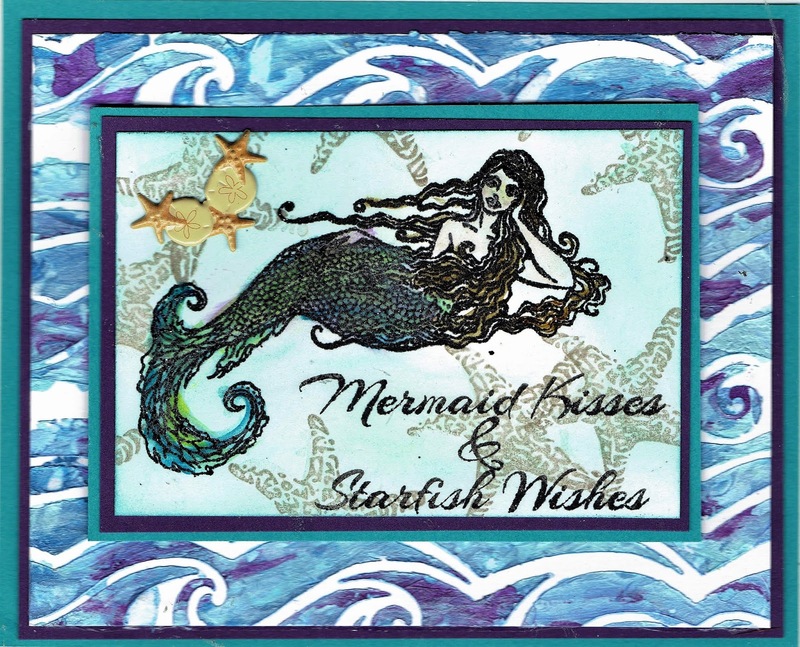 I used Nuvo Glitter Gloss Aqua pen on the speckle stamp in this set to create the stars. 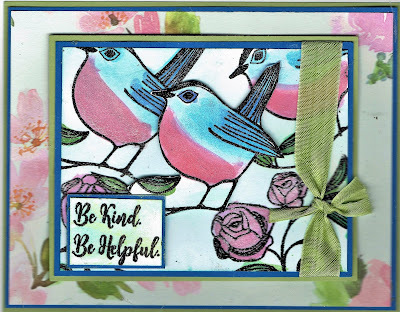 The birds are from Blue Knight stamps. 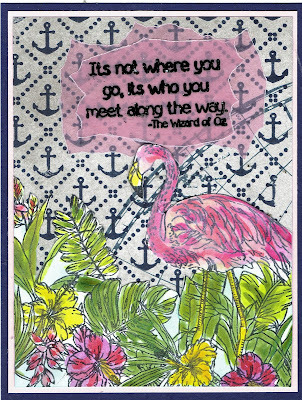 http://techniquejunkies.com/zinnia-set-stencil/ - from A Colorful Life stencils. A glittery brad in the center of each flower finishes the card. Hope your day is marvelous and that you find time to do some "inky work." I used a sponge with Nuvo Embellishment Mousse - http://techniquejunkies.com/products-and-accessories/nuvo-mousse/ - and spread the mousse all over a piece of white card stock. I used 3 different colors. as the background stamp. 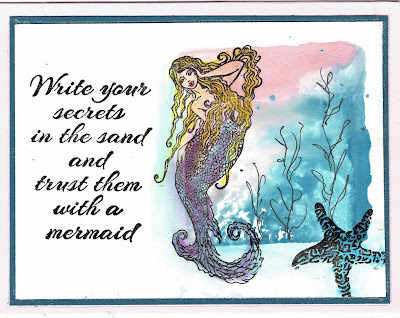 I used some white vellum and stamped the saying and a shell from Shells - set of 4 - http://techniquejunkies.com/shells-set-of-4-palettini/ , and the starfish from Mermaid Kisses - www.techniquejunkies.com/mermaid-kisses-set-of-5/. They were all heat embossed. I used a Copic marker to color in the letters in the word "sand." The white vellum was layered on light blue vellum and adhered to the card. May your day be glorious and your free time be inky! All of these lovely stamps are from the Technique Junkies stamps set Mermaids Kisses - www.techniquejunkies.com/mermaid-kisses-set-of-5/. I used Twinkling H2O's to watercolor the images with a beautiful simmer!The background was stamped with an acrylic block pressed with ink pads and spritzed with a bit of water. I drew in some sea weed. The verse is heat embossed. You can get 10% off of everything else that is not on sale by using the code TJ10Judy. 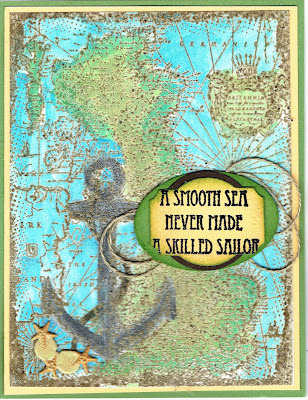 This card features three Technique Junkies Stamps: Anchors background - www.techniquejunkies.com/anchors-background/, Wisdom of Oz - http://techniquejunkies.com/wisdom-of-oz-set-of-7/, and Filled With Wonders - http://techniquejunkies.com/filled-with-wonders/ . The verse was heat embossed on vellum and layered on another small piece of torn vellum. The flamingo and foliage were painted with Twinkling H2Os. I hope your day is going swimmingly, and that you have a chance to get inky! http://techniquejunkies.com/bring-wine/ . 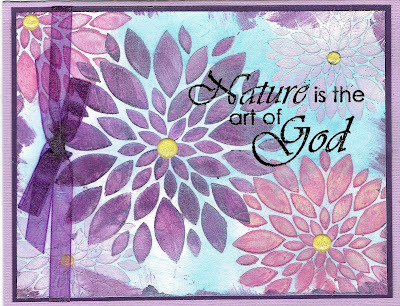 I water colored the images and layered it with cardstock and then layered it on some lovely floral background paper. The middle bird was fussy cut and layered on top of the other birds. But what I really want to talk about is the beautiful shimmer and how that was achieved! 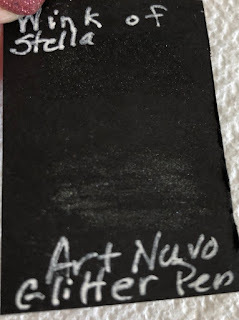 I used the Art Nuvo Glitter Gloss Aqua Pens - http://techniquejunkies.com/nuvo-glitter-gloss-aqua-pens-set-of-2/ . The amount of shimmer they add to a project certainly gives the art work a very delicious shimmer! It is just beautiful. I also own Wink of Stella pens. I want to show you the comparison of the two types of pens. It was hard to get a photo to show you the shimmer. This first one is just on red card stock. The top is Wink of Stella and the bottom is Nuvo Glitter Gloss Aqua pens. This next one is on plain black paper. They both had shimmer but the Nuvo pen had more colors in the glimmer and was just lovely. Next I used watercolor pencils and used both the Wink of Stella pen and the Nuvo Glitter Gloss Aqua pen. They both moved the color in the water color pencils and both added glimmer. However, the Nuvo Gloss Glitter Aqua pen had more glimmer than the Wink of Stella. I was surprised at the results. I thought they would similar. And lastly I used both over Prisma Color pencils. 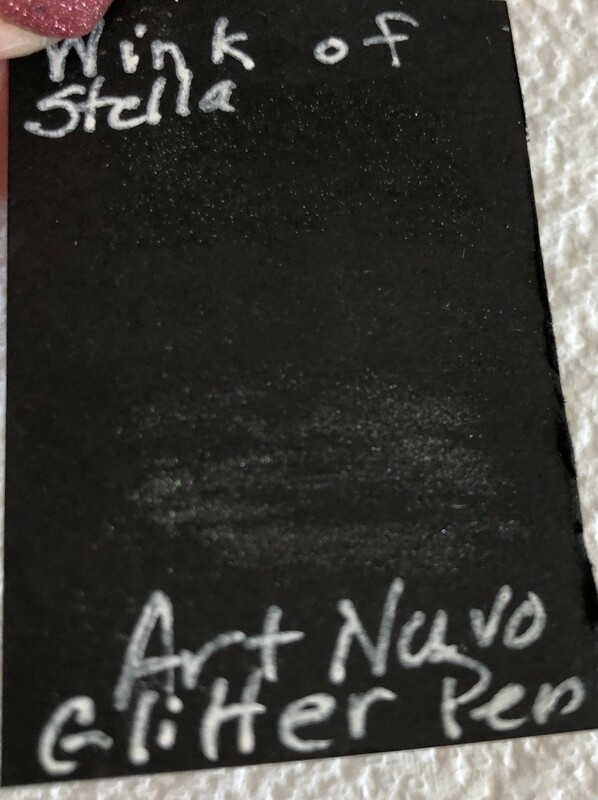 Both had glimmer but the Wink of Stella was slightly more opaque over the Prisma Color pencils than the Nuvo Glitter Gloss Aqua pen. I found this experiment to be very interesting. 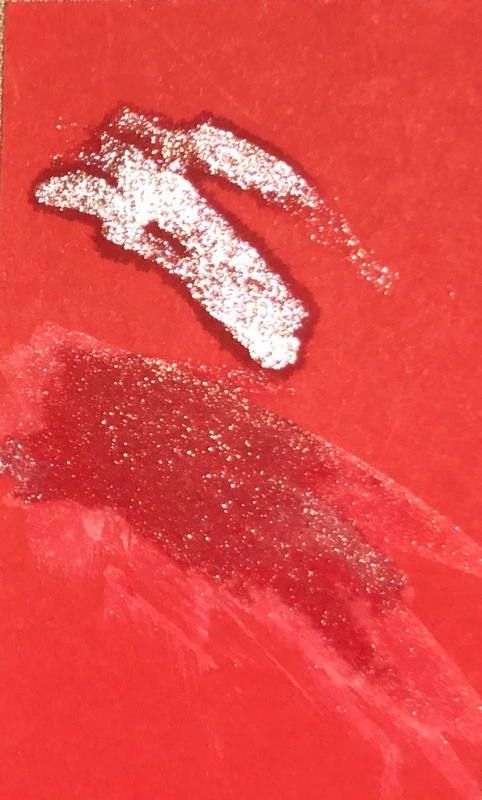 II have tried different brands of glitter gel markers and found that the "original" glitter gel markers were better and more glittery than the "newer and more expensive" glitter gel pens. So I really like the Nuvo Glitter Gloss Aqua Pens. Here is the direct link - http://techniquejunkies.com/nuvo-glitter-gloss-aqua-pens-set-of-2/ . And I think they are slightly less costly than the Wink of Stella pens because you get two in a package. 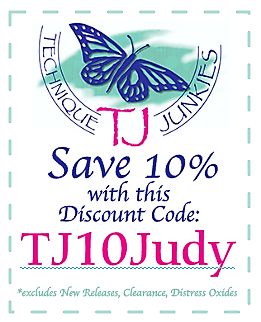 And just like always, you can have a 10% discount by using the code TJ10Judy and this code is good on anything on the Technique Junkies website unless it is already on sale. 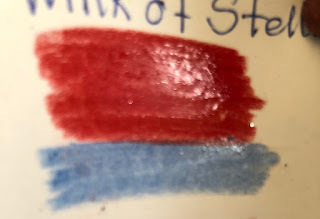 So I hope you have found this blog post informative, and that you can find time today to get inky. 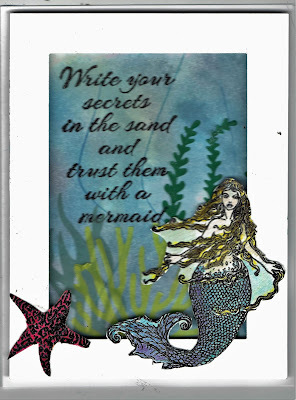 www.techniquejunkies.com/mermaid-kisses-set-of-5/. She is painted with Twinkling H2Os. 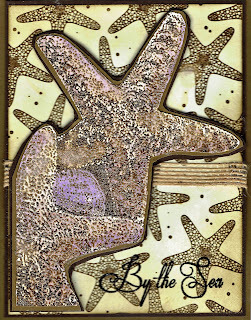 The starfish from this set stamped in tan ink all around the mermaid for the background. the wording is heat embossed. Have a wonderful sunny day, and get inky! I painted the sunflowers with Twinkling H2Os and oh, how they shimmer! I stamped the largest sunflower a second time, painted it, and then fussy cut the sunflower only. Then I popped it up twisting the flower so it doesn't line exactly with the lower level of the flower. That gives it some added dimension. 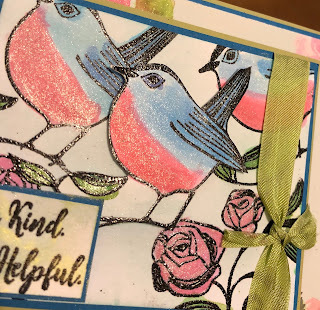 Tiny bows and the heat embossed verse in the corner finish the card. You can gain a 10 % discount on everything else if you use the code TJ10Judy! Have a fun and wonderful day, and get inky!! The sea is just beautiful! I enjoy walking by the sea, and sitting by thew sea and watching waves, and gathering sea shells. But starfish are not easy to find - especially in good condition. Starfish are not like regular shells which may have a living animal in them, a starfish IS the living animal. 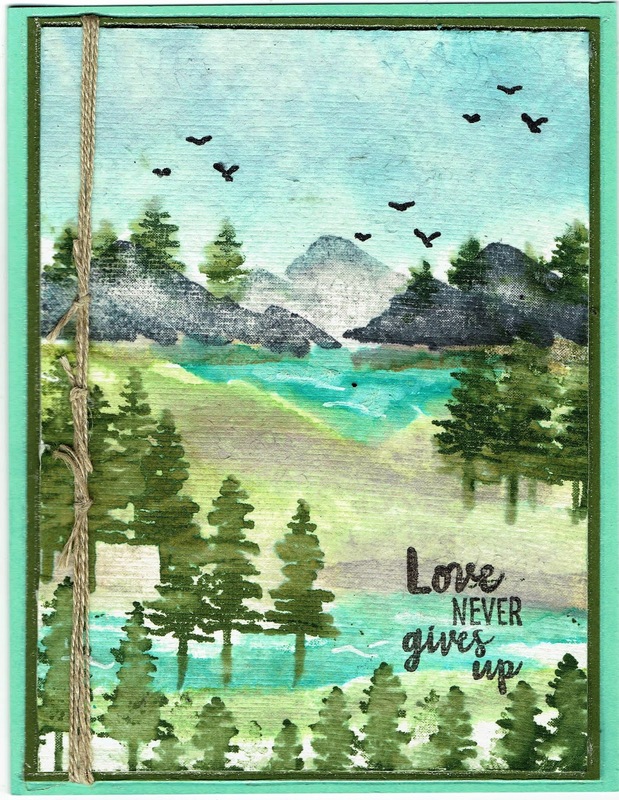 I used three different stamp sets to create this card. 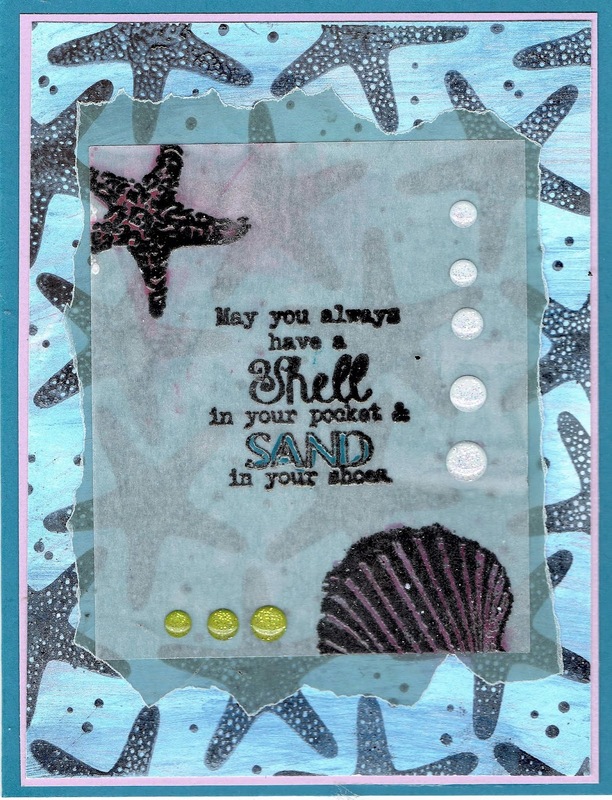 I used a new June Technique Junkies Stamps release - Fun Starfish - www.techniquejunkies.com/fun-starfish/. I also used some older stamps: - Starfish - http://techniquejunkies.com/starfish/ ; and By the Sea - http://techniquejunkies.com/by-the-sea-set-of-6/ . 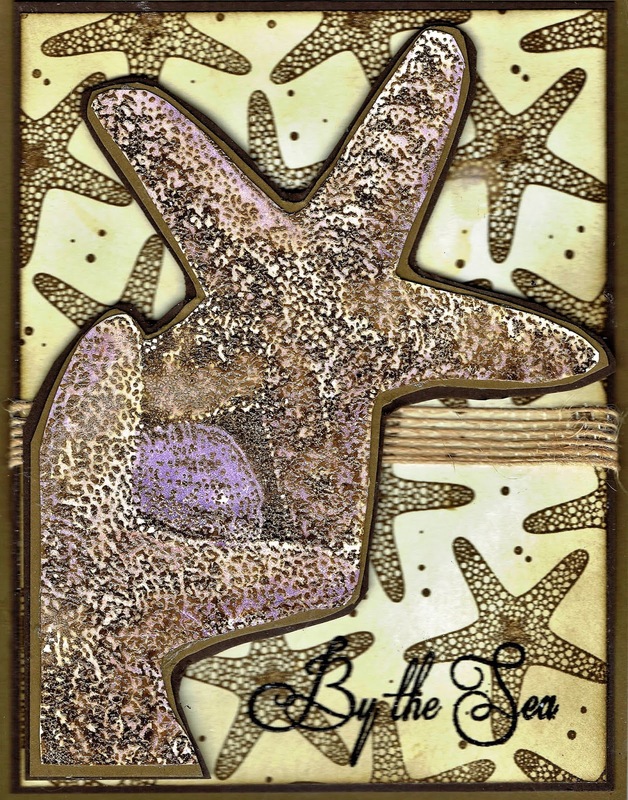 I cut out the starfish from a larger stamped image and layered it on dark chocolate card stock, and cut that as well. The words By the Sea are heat embossed. Please remember that all of the June Technique Junkies Stamps releases are on sale for 15% off through June 8. In addition, you can get 10% off of everything else that is not on sale by using the code TJ10Judy. www.techniquejunkies.com/mermaid-kisses-set-of-5/ . I used an acrylic block pressed into a couple of ink pads, and spritzed with water to stamp the ocean waters. I die cut some sea weed from vellum. Then I layered a white on white frame popped up with dimensionals. The mermaid and starfish were colored with Copic markers. The mermaid is also popped up. 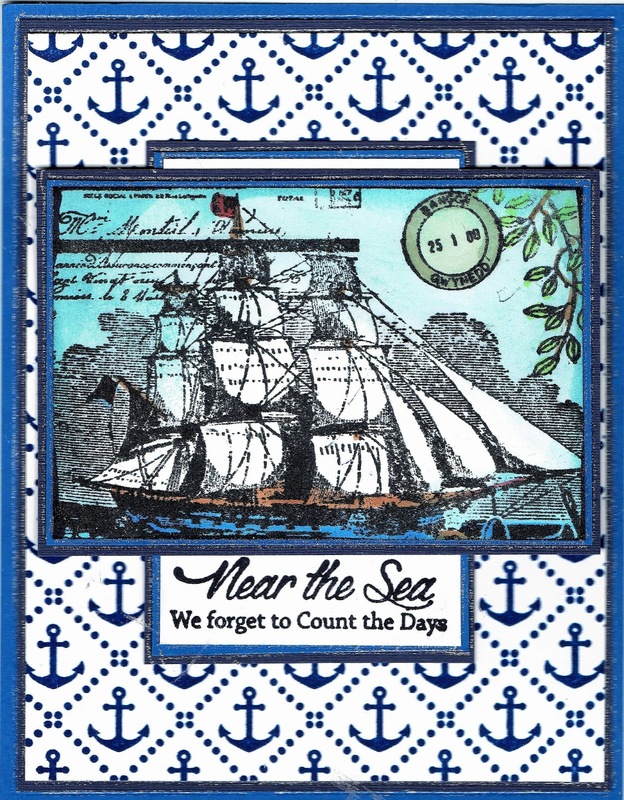 It's June - Warm Days and NEW Stamps!! It is now June and that means new stamps for Technique Junkies Stamps! And they are wonderful. You can find all of the new stamps here: www.techniquejunkies.com/june-2018/. 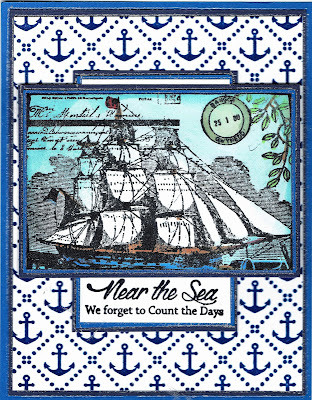 And you can get a 15% discount on all of the new June stamps through June 8! And you can use TJ10Judy for 10% off of everything else (Unless it is restricted!). 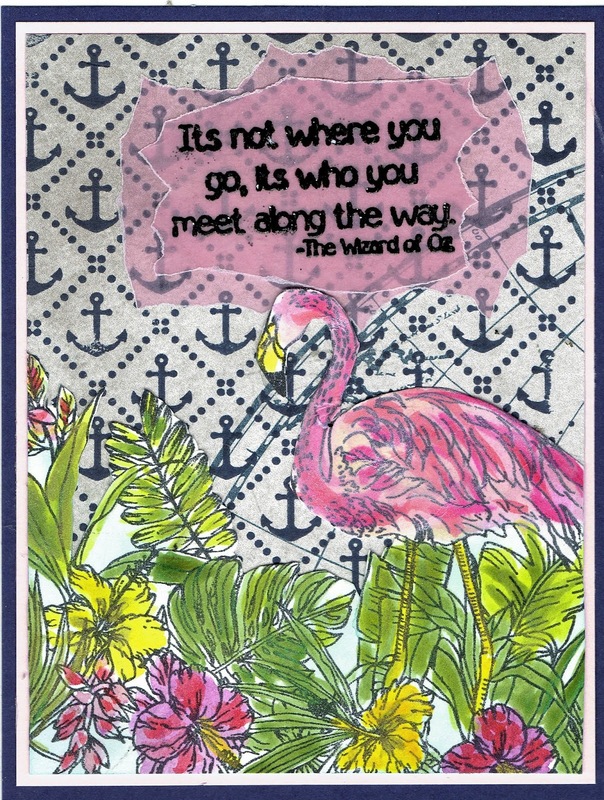 The beginning of the June Blog Hop begins here: https://techniquejunkies.blogspot.com/2018/06/technique-junkies-june-release-hop-and.html. 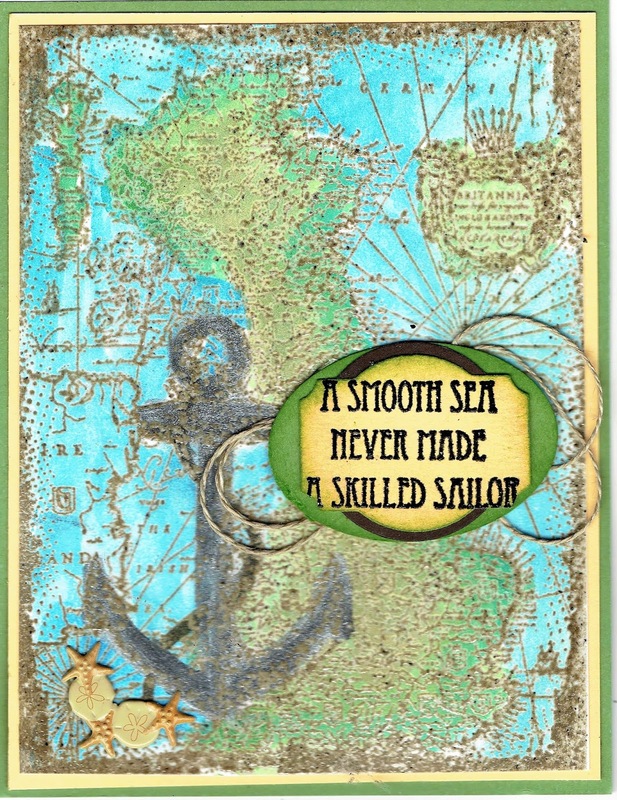 www.techniquejunkies.com/anchors-background/, Vintage Ship Collage - http://techniquejunkies.com/vintage-ship-collage/, and By the Sea - http://techniquejunkies.com/by-the-sea-set-of-6/ . The image was colored with Copic markers and the sky was sponged. The verse was heat embossed. I added some linen thread loops and a brad. 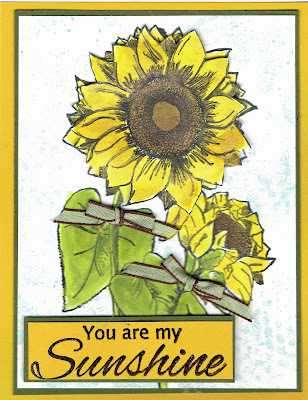 , and Sunflower Sentiments - . 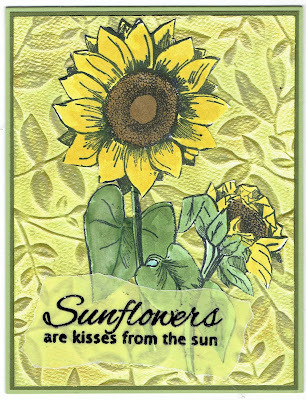 www.techniquejunkies.com/sunflower-sentiments-set-of-2/. 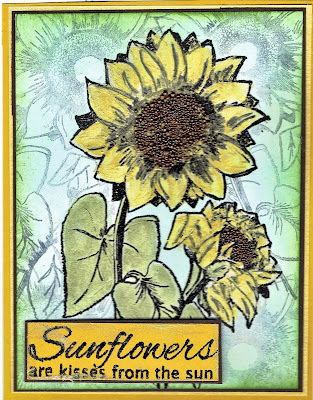 I used a combination of Art Nuvo Embellishment mousse and and Twinkling H2Os to color the sunflowers. The background is stamped with a pale blue ink. The verse is heat embossed. The center of the sunflowers are brown Prills. You will head on now to Beth Norman's blog - http://www.sunflowers-dragonflies.ca/blog/61116/technique-junkie…release-for-june/ . She always has wonderful things to show us! Remember you can get 15% off the stamps in the June release through June 8!! And you can get 10% off of everything else (unless already on sale) by using the code TJ10Judy.